Start by measuring 1 cup of gluten-free oats, 1 cup of cashews, 1 tbsp. hemp seeds, 1 tbsp. chia seeds, throwing that in the food processor and pulsing into you get a resemblance of small crumbles not like a flour. Pit 13 medjool dates before processing removing the pit from the center. Add the pitted dates along with, 1 ½ tbsp. coconut oil, 2 tbsp. maple syrup (optional), and 3 tbsp. raw cacao powder (more or less depending on preference), and 2tbsp. non-dairy milk I used flaxseed beverage. Start by pulsing for around 45sec-1min until you get a really sticky mixture making sure all the ingredients are combined. Lastly, line a bread pan or brownie pan with parchment paper so the sticky mixture won’t stick to the pan after taking out of the freezer. Once you fill the pan to the desired thickness place in the freezer for 2-4 hours or overnight allowing the mixture to sit and form into delicious raw brownies. 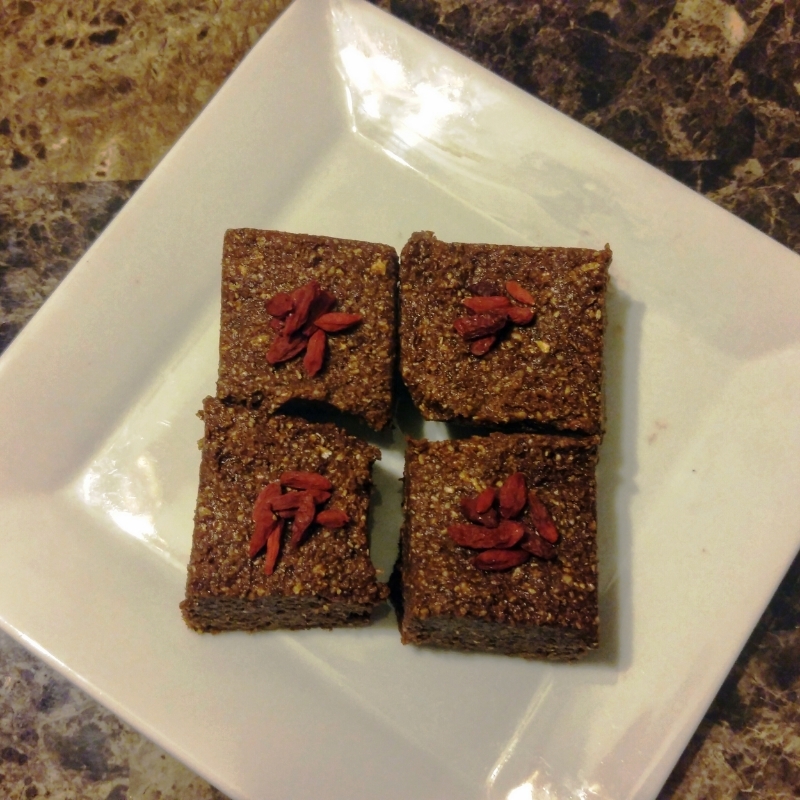 Wala all done, I will that you in-joy processing and making these healthy rich raw brownies.